Houston Paintball: Why Is Paintball Gaining Popularity? While paintball might have been a fringe sport 20 years ago, today everyone knows what it is. Some think of it as more of an extreme sport, others a highly-organized spectator sport that draws thousands. It got us thinking: what’s lead to the rise of paintball? Why are more people getting into it, both as a fan and as a player? 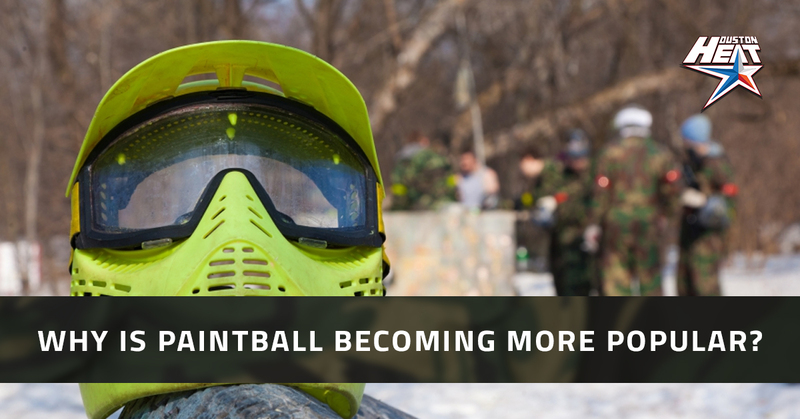 Let’s take a look at why paintball is growing in popularity. When cable started reaching the average American home in the early 1980s, there were a couple dozen channels. Now there are hundreds, and they’re all hungry for content. As there are more sports channels, there are more professional paintball games that people can watch. The internet plays two parts in helping action sports like paintball grow. The first is similar to cable, in that it allows more people to catch up on tournament games and highlights of amateur games. The second role the internet plays is providing information to players and giving them a place to interact with each other. Newbies can learn more about equipment while finding out where the next skirmish is going to take place. In paintball, we use markers, not guns. But let’s be honest, they’re essentially guns! Guns are a big part of the history of this country, considering we used them to gain our independence. Paintball allows people to engage in warfare without threat of serious injury, which certainly beats real war. Speaking of guns, the rise of first person shooter (FPS) video games such as Halo and Call of Duty created an interest in team-based online play. But many of us get tired of sitting indoors and would rather play on a team in real life, making paintball the perfect outlet. Baseball might be America’s pastime, but football seems to have the most rabid fans. It certainly has the most-watched game of the year. One reason we think paintball might be so popular is that it has a similar “land acquisition” ideal that you’ll find at the heart of football. But as the dangers of long-term playing in football become more apparent (see chronic traumatic encephalopathy), football might be on its way out. Seems like the perfect time for professional paintball to come in and “mark” that territory. Paintball started as a fun way to pass the time on a weekend. Head to a park or out in the woods and try to hit your friends with some paint balls. But as it’s become more popular, players become more and more interested. Equipment gets better, rules are set, pro leagues get started. Professional paintball is becoming more and more organized, with events popping up all of the globe. Houston Heat has played in five countries on three continents this season. Paintball continues to grow because it’s an absolutely amazing team sport. And while it might share a few traits with other sports, it’s really like no other! Find out more about our Houston sports team right here.